This paper is the second in an interesting four Part series on stereo microscopes. Here the early evolution of stereo microscopes and the Greenough microscope are presented. For over 150 years this simple microscope design played a prominent role in scientific discovery. Microscope cameras were not cheap back in 1998. My solution was to draw the specimens that I observed. Water fleas, flatworms and other meiofauna often carry epizoic ciliates. 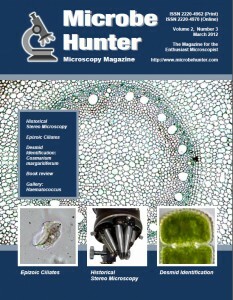 When will the March 2012 paper issue of Microbe Hunter magazine be available to order? I’ll try to get it out in the next few days. There are some updates and corrections that I still have to do to the March issue.